Summer is winding down, which means it is once again time for my semi-annual roundup of some of the more unusual, or at least less-common, gardening questions I answered this season. Hopefully there’s something here that you’ll find interesting or helpful. How do I save tomato seeds? It’s easier than you might think. Scrape the pulp from a few of the same tomatoes into a jar with some water in it and stir. Put a lid on the jar and let it sit for a three or four days at room temperature, stirring a couple of times a day. You want seeds to drop to the bottom so add more water if you need to and continue to stir. Once there are many seeds on the bottom of the jar, skim off floating seeds and any mold, if you see some. Carefully pour out some of the water and add fresh water before skimming the top again. Once the container looks clean and there is little to nothing floating, pour off all of the water through a fine strainer and spread your seeds out to dry. I use a dinner plate, but you can also use screen or a cutting board, whatever works. Saving tomato seeds is easy. Can I use Milorganite to condition straw bale gardens before planting? I’d say gardeners have to decide this for themselves. Here are the facts: Milorganite is a fertilizer made from treated sewer sludge from the Milwaukee Metropolitan Sewerage District. The sludge, which comes in pellet form and smells kind of gross, but not in the way you would think, is marketed as being great for trees, shrubs, lawns and home gardens. It is also a good deer and rabbit repellent. The problem is, while Milorganite is deemed safe for consumer use by the US Environmental Protection Agency, testing has shown that it contains contaminants that the treatment process cannot remove, such as heavy metals, pathogens, pharmaceuticals and other toxic chemicals. Because of this, I steer clear of using it on or near edible plants. If you’re going to plant a straw bale, there are many other safe, organic fertilizers to choose from. I want a red-blooming delphinium. Is there such a thing? Happily, there are some varieties of red delphinium, and I would suggest ‘Red Caroline,’ which has coral-colored blooms that darken to red as they mature. Like most delphinium, they will do best if you stake them so they won’t topple over. Pollinators and hummingbirds love these flowers, and plants are hardy to Zone 4, so they will survive our horrifying winters. While you might find these in garden centers, it’s probably easier to go online and order either seeds or plants. Is garlic a good insect repellent? Yes, it definitely can be. You can buy various types of garlic-based sprays and oils, or you can make your own by tossing two large cloves of garlic and 4 cups of water into a blender. Strain the mush through some cheesecloth once or twice and dilute what’s left with another cup of water. Test the garlic repellent on a plant or two that you don’t care about so much before spraying it widely; just to be sure you’re not causing any damage. Tests have shown that whiteflies, some types of beetles and aphids are all repelled by garlic, though be aware that your garden’s going to be a bit smelly for a few days. If you read my column even occasionally, you’ve likely gleaned that I’m not very keen on the Minneapolis Park Board’s outdated, chemical-laden approach to managing our public parks, ball fields and other outdoor spaces under their control. Today, though, I want to acknowledge something they did recently that was actually good. If you haven’t already heard, in late May, Minneapolis joined other cities, including St. Paul, Minnetonka and Northfield, in using goats to help manage invasive plants, like buckthorn and garlic mustard. My husband, Mike, and I saw the goats in action near Cedar Lake’s east beach (Hidden Beach) a few weeks ago. And I have to say that one week into their 10-day stay, those goats had pretty much denuded the 6-acre area they were corralled in. It was wonderful to see and hear them as they wandered around with their babies munching on greenery. Apparently their next stop will be the northwest portion of Wirth Park in late July. Rented from Diversity Landworks of La Crescent, Minn., the goats were protected by two layers of fencing and an on-site shepherd, Jesse Dale. While the creatures can’t control invasive species in just one visit, the hope is that repeated visits will at least keep problem plants in check. It the Park Board sees positive results they say they may cut down on the amount of glyphosate (the active ingredient in Roundup) and other herbicides they are currently using. Let’s hope that’s the case. Go goats! Food forests—if you haven’t yet heard of them, you will. The concept is best known in connection with permaculture, which goes beyond organic growing to create landscapes that exist in harmony with nature. 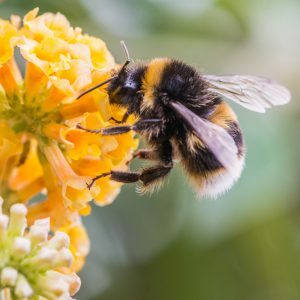 Designed to include nut- and fruit-producing trees and shrubs, as well as many other edible and pollinator-friendly plants, food forests are not only interesting and enchanting. They provide food for people and wildlife. They also make if possible for people, particularly urban dwellers, to see up close how food is grown and experience the joy of picking something and eating it. Heck, they may even inspire some to add edible plants to their home gardens. For all of those reasons and more, many cities around the country—and the world—have opted in the last 10 years or so to turn vacant city lots and patches of parks into food forests and community orchards. London; Victoria, British Columbia; Calgary and Toronto, Canada; Seattle, Washington; Bloomington, Indiana, Madison, Wisconsin; Asheville, North Carolina, Glendale, Ohio; and Philadelphia, Pennsylvania, are just a few of those cities. More information on those projects and a list of others can found here. Minneapolis makes the list with the Bancroft Meridian Garden Food Forest. The lot along 38th Street started out as a flower garden tended by the community, but in 2014 the group decided it was time to create a food forest that was more sustainable for people, wildlife and the land. Everyone in the community is welcome to stroll around pick a few berries, apples, herbs or other things. The idea is not to harvest the food, but to create an urban foraging space for all to enjoy. More food forests will hopefully be a part of Minneapolis’ future. But one thing is clear: it is going to take advocacy from people like us to make that happen. Russ Henry, a longtime activist and landscape designer who is running for an at-large Park Board seat, and Ryan Seibold, who leads the Hiawatha Food Forest group, have been working for months to get a food forest started near Lake Hiawatha on the site of the frequently flooded Hiawatha Golf Course. Public feedback has been positive for the most part. In many different public meetings, thousands of residents (golfers and non-golfers) have expressed support for the idea of restoring the wetlands, which were drained in the 1930s to create the golf course. Along the edge of the wetland on a little big higher ground, edibles could be planted to create a walkable food forest. The idea was by far the most popular among those that were pitched during a March 16 “Innovation Lab.” Organized by Henry, the event drew more than 150 people who wanted to hear farmers, beekeepers, restaurateurs, composters and other interested folks offer their thoughts on transforming the local food system. “People like the idea of being able to do some food foraging in parks,” says Henry, who believes food forests have the potential to also connect people and build communities. If I were able to retire tomorrow, one of the first things I would do is read more. I already read a lot: I love books. But I could read a lot more if I didn’t work so, fingers crossed that we win the lottery sometime soon so I can get to the stacks and stacks of books taking up space all over our house. One of the things I did manage to do recently was catch up on the books I’ve received to review. Here are some of my favorites. First, though, you’ll notice these books are not the latest, hot-off-the-press sort of thing. I read as I’m able and review some of what I like. If I don’t like something, I take my grandma’s advice to “not say anything if I can’t say anything nice.” I figure, just because I don’t like a book doesn’t mean you won’t. Why be a spoiler? Beautifully Sustainable: Freeing Yourself to Enjoy Your Landscape (Be-Mondo Publishing, 2013), by Douglas Owens-Pike. I met Douglas several years ago when he invited me on a mini tour of some of the Minneapolis gardens his landscape design firm, EnergyScapes, had created in recent years. All of them were lovely and different from most “designed” gardens in the sense that were very natural, consisting mostly of native plants and arranged as if Mother Nature had done it herself. True to his company’s name, the landscapes were all created with resource conservation in mind. Beautifully Sustainable (which can be purchased here: http://energyscapes.com/book/) is Douglas’ attempt to help gardeners at all levels make their landscapes more sustainable, and his smart, clearly explained ideas and tips are very useful. But I also appreciate how on a more subtle level, his book helps readers think more like a designer when visualizing outdoor areas: What sort of space would I really enjoy? What features matter to me most? What view do I want to see from my living room? All of these questions seem easy, and they are. But most of us don’t think of them until the patio is poured or the pergola is built in what turns out to be the totally wrong place. “Take time to imagine,” he wisely suggests, before explaining how to create a map of your landscape long before you buy the first plant. Other chapters cover things like how to build healthy soil, create a rain garden, get rid of weeds without chemicals and how to maintain a landscape once its planted. In other words, there’s something for everyone in this helpful, enjoyable book. For those who want to learn more about growing edibles in our climate, take a look at Emily Tepe’s The Edible Landscape: Creating a Beautiful and Bountiful Garden with Vegetables, Fruits and Flowers (Voyageur, 2013). Emily was doing fruit research at the University of Minnesota when she created an edible demonstration garden and fell in love with growing food. There are lots of things to love about Emily’s book, but in particular I appreciate the way she accompanies her advice to incorporate edibles into gardens with colorful illustrations that show exactly how that can be accomplished­ beautifully. 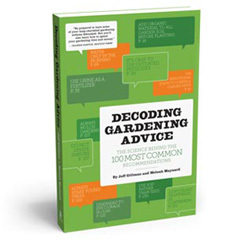 While the book is a general primer on growing edibles, the appendix includes an extensive list of edible plants specifically for northern gardeners. I found several varieties there that I’m going to try this year. 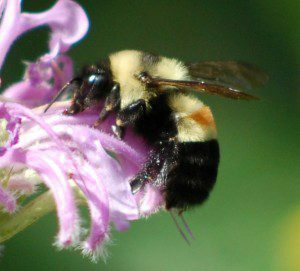 Gardeners who want to help support pollinators and other beneficial insects should check out Minnesota landscape designer Heather Holm’s fantastic book, Pollinators of Native Plants (Pollination Press, 2014). While the text sometimes made me reach for my botanical dictionary and refer to the glossary in the back of the book, Heather really did a great job of conveying complex subject matter in a relatable way. Don’t want to learn about the actual process of pollination? Skip to the descriptions of the many different creatures that visit flowering plants. 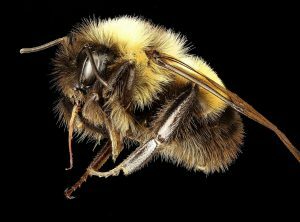 Read up on bees and how they live and work together. Or jump right to the bulk of the book where native plants are described in detail along with the insects that are partial to them. The photos alone are outstanding. 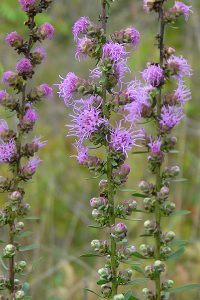 But the information Heather offers about natives for three distinct habitats: prairies, woodland edges and wetland edges, can be used by all gardeners who want to attract pollinators. And isn’t that all of us at this critical time?